We are so close to finding out if this baby is a boy or a girl! To say I am excited would be an understatement. With Leighton I was positive from the beginning that he was going to be a boy. This time around, I have no idea at all. Some things make me think girl, some boy. Nate wants a girl so we can for sure be done after this one, ha! Really I just want to know if we can reuse Leighton's stuff or if we get to start shopping for bows, florals and sequins. This week we had Leighton's birthday party and a Christmas cookie day, so before that Nate and I did a TON of cleaning. I felt the urge to really start sorting through things and purging. I didn't start doing much of that with Christmas and other activities coming up. Watch out January, I feel like it is going to be a cleaning and purging month. I'm still craving sweets, McGriddles, and spicy things. My nose bleeds are still happening. I may put Leighton's humidifier in our room for a bit and see if that helps. Really they are the worst right when I wake up - I'll blow my nose and all hell breaks loose for a bit. Any suggestions are much appreciated, just leave them in the comments. I managed a leg workout with my lovely friend that left my legs feeling like noodles for days. It was great. With the pinching feeling around my tailbone and some other back aches, I know that I need to focus on getting my body right and ready. My acne has been so much better, and my skin is almost acting a little dry. I'll take it, and I hope it sticks around. 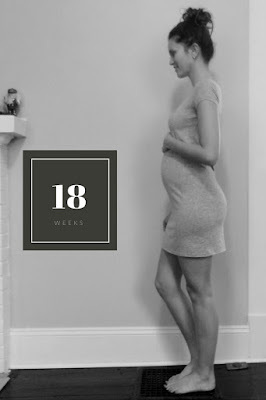 It is ridiculous how much earlier things are happening with this pregnancy compared to my first. I am feeling out of breath pretty easily and bending over to pick something up is the worst. I haven't been able to button my jeans since 8 weeks, not comfortably at least. Belly Bands are my best friend. Best news so far, orange juice does not make me nauseous! I kept avoiding it because I was scared that I would get sick like I did with Leighton. Finally, I tried it and hallelujah, nothing happened. Give me all the OJ please. Baby is the size of a bell pepper (5-5.8 inches and about 5.3 ounces). Ears and eyes are moving toward their final position, bones are hardening and finger/toe prints are starting to form. I am feeling it move and shift around (mostly at night). And that is all for now. I am starting to come up with a list of things we need for transitioning to a life with a two-year-old and a toddler. If you have any suggestions of things that were super helpful send them my way! Follow along with our life on Snapchat and Instagram, katianne1519 on both!